There are two screenings happening this week. One is at the Park City Film Music Festival--a ground breaking event dedicated to all aspects of music in film, everything from music based documentaries to music videos and feature films that use music as an essential element. 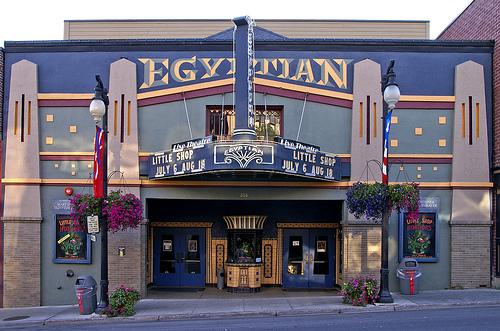 The film is being shown at the Egyptian Theater in Park City, Utah on Wednesday May 19th at 6:15 pm, and I will be there. Here’s a link to the festival site, you have to then use the pull down menu to get to the specific page for May 19th: http://www.pcfmf.com So if you’re in that area, hope to see you there. Finally, a brief report on the screening at the Sensoria Festival in Sheffield England on April 26–it was a lovely event at another wonderful music film festival. There was a most enjoyable Q&A afterwards with Martyn Ware and I met lots of different people, including several Americans who had come over to participate in various festival events. Many thanks to Jo Wingate and Nigel Humberstone for producing such a terrific music/film festival. And for those of you in the UK, a bit of a reminder, the film will be having its UK premiere at the Sensoria Festival of Music and Film in Sheffield on April 27th. This is a really cool festival and I’m very excited to be a part of it–I will be there for the screening and discussion afterward with Martyn Ware. http://tinyurl.com/y7ep8xo. Update April 21–of course there’s some risk of my travel being canceled due to this pesky volcano situation in Iceland, but at the moment things are looking up for our Saturday departure…. The UK premiere is now locked in for Tuesday, April 27 th at the Sensoria Festival of Music and Film in Sheffield, England. Here’s a link to the page for the film: http://2010.sensoria.org.uk/events/film/uk-premiere-deconstructing-dad-the-music-machines-and-mystery-of-raymond-scott-pg/comment-page-1/#comment-32. I will be attending and there will an interview and Q&A afterwords moderated by Sheffield native and electronica legend Martyn Ware, music producer and co-founder of The Human League, as well as Heaven 17 and the Arts Council project Future of Sound. I’m really looking forward to all of this…hope you can make it!